On January 22, at the Naha Civic Hall, participants in a rally renewed their pledge to request to the U.S. and Japanese governments that the deployment of the Osprey be rescinded. About 1300 people participated in the rally. They criticized the U.S. and Japanese governments for forcing through deployment of the Osprey to Okinawa, saying, “The deployment is a reckless act that serves to further humiliate the Okinawan people who have already suffered the excessive burden of hosting the U.S. military since the end of World War II.” The participants adopted the resolution unanimously, asserting that the deployment of the Osprey represents discrimination against and bullying of the Okinawan people and therefore cannot be ignored. Onaga talked to the press after the rally, saying, “Applause just went on and on. I strongly sense their determination in requesting that the U.S. and Japanese governments rescind the deployment of the Osprey. 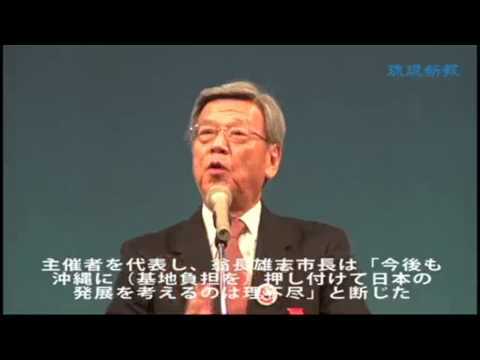 I am confident that the Okinawan people’s voices will be more broadly heard by those living in the main islands of Japan.” Onaga renewed his pledge that he and other representatives will convey the Okinawan people’s will to oppose the Osprey deployment to the central government in Tokyo on January 27 and 28.